There are certain iconic scenes in art that everyone from the casual museum-goer to the serious art collector can recognize instantly. Scenes including the Last Supper, the rising of Apollo’s chariot, and the triumph of David over Goliath have been depicted by artists across the span of art history, and though the style and medium of these artworks may vary, the scenes remain easily identifiable. 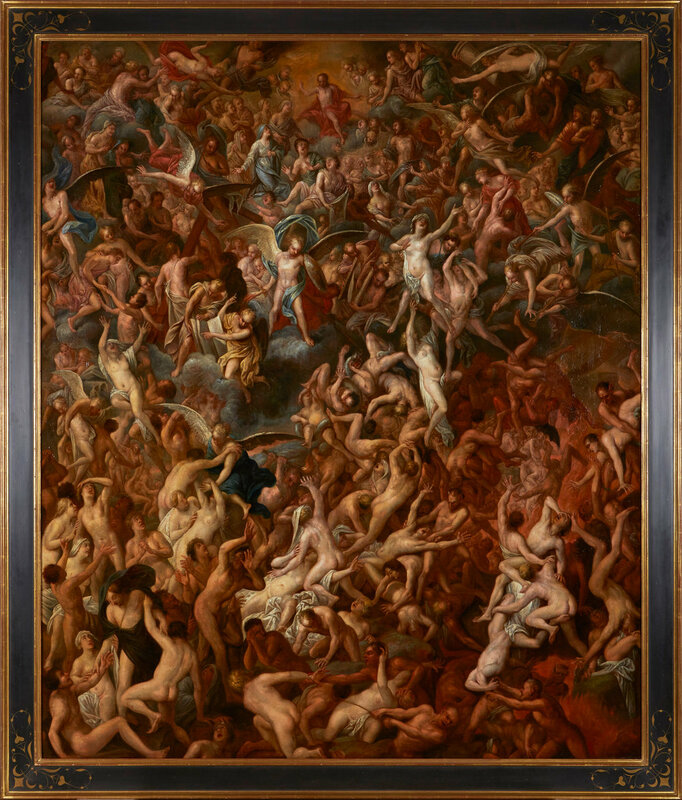 Another of these iconic scenes is that of the Last Judgement. Artworks imagining the moment when the fate of souls is determined for eternity can be seen everywhere from the Sistine Chapel to local church walls. So when a large-scale painting of the signature scene came to The Conservation Center in need of treatment, we were honored to play a role in its conservation and preservation. Amounting to 83 ½” in height and 72” in width, the conservation of The Last Judgment proved to be no small task. When the painting arrived at The Center for treatment, the thickly applied varnish had become discolored, giving the overall painting a yellowish tone in appearance. In addition, the surface of the painting exhibited white accretions throughout. The supportive structure of the piece demonstrated severe conditions. The stretcher had begun to deteriorate and bow, creating deformations throughout the canvas. The lining, which had been added in a previous conservation campaign, had become brittle and the original canvas started delaminating from it. To treat the painting, our conservators carefully removed the piece from its stretcher. The lining and the heavy layer of adhesive was removed, and the canvas was relined to a new, synthetic canvas. The newly lined canvas was stretched to a new stretcher with multiple crossbars, necessary to support a painting of this size. The old varnish was thinned to reveal the vibrate painting's colors. Then a fresh coat of varnish was applied to the surface to saturate the paint layer, and areas of loss were inpainted using conservation grade materials. A final coat of varnish was then added to integrate the overall surface gloss and protect the paint layer. To finish treatment, our conservators reframed the piece into a custom wooden frame with closed corners, black paneling, gilt trim, and gilt sgraffito corner flourishes. Just as The Last Judgment serves as a reminder of mortality, so too does the field of conservation. The Conservation Center acknowledges the fleeting fate of our cultural heritage, and works against it little by little to demonstrate that preserving art is preserving history.